definitely Avocado on Toast, with my own little spicy twist and a couple of boiled eggs for that added protein. If you like the look of the photos above, just keep reading to find out what you'll need and how I made it! - Place the kettle on to boil. Once boiled add to a saucepan and place in the eggs. Boil for 6 minutes. - Place the bread in the toaster. - In a small bowl, combine the avocado, lemon juice, salt, pepper and chilli flakes and crush together using a fork. - Chop the tomato into small pieces and combine with the avocado mixture. - Once the eggs have boiled for 6 minutes, strain the water and peel off the shell. - Once the bread has toasted, place onto a plate and spread over the avocado mixture. - Place the boiled eggs on the top, cut in half and let the egg yolk ooze over. - Finish with some black pepper and enjoy! This year, I have wanted to improve my health and fitness, more drastically than last year, and I thought the first thing I really needed to change was my eating and drinking habits, not that I was doing either badly, I wanted to find healthier, more beneficial snacks that I could use as replacements for some snacks that weren't so good for me. I was recently browsing in my local Sainsbury's after work one day, looking for some new, healthier snacks to try when I came across the Kallo Dark Chocolate Rice Cakes. I'd never tried rice cakes before, but I was really impressed with these. Such a tasty, high fibre snack, I would definitely recommend these to any chocolate lovers out there, still a great chocolate taste, with much more added health benefits, without the added calories. and the Nakd Ginger Bread Bars. I had tried the Cocoa Delight raw bars previously and enjoyed those, so I was hoping I'd be happy with some of the newer flavours, and I am in love, especially with the Ginger Bread Bar. It had such a sweet and spicy taste, just like Christmas! It just tastes so heavenly and I can't believe there is so little ingredients but such a great, authentic taste. These bars are a perfect on the go snack, whether you have them whilst travelling to work for breakfast, or as a simple in-between meal snack. They are super tasty and only made with very few ingredients, so there is nothing nasty or processed in these. Since I bought my Breville Blend Active about a year ago, I've definitely upped my game when it comes to making smoothies, especially for breakfast if I'm in a rush. Smoothies are so quick and easy to make, it's a great alternative for a simple, nutritious breakfast. Recently I was kindly send a few health powders and tablets, that you can combine into your smoothies, that add great health benefits without spoiling the taste. I've been using a mixture of the Indigo Nutrition Organic Supergreens Powder* / Indigo Nutrition Organic Spirulina Tablets* / Indigo Nutrition Organic Wheatgrass Powder* and simply adding a small amount to my breakfast smoothies in the morning and I have really been liking using them. Even though you can't physically see any health benefits, you know that they are all packed with great nutrients and vitamins, it's something so easy you can incorporate into your lifestyle to lead a healthier day to day life. Something new I'm trying this month are the Proper Pops Lime, Lemongrass and Garlic Chips*. "We pop our nutrient rich chips under pressure. They don't go near a fryer, so they're 100% FULL OF TASTE with almost 90% less fat than your average crisp." The pop chips are basically a healthy alternative to crisps, and these ones I received definitely packed a punch with the flavours used. With a slight Asian influence, the Lime, Lemongrass and Garlic flavours were something I really enjoyed and I would really like to try some other flavours from the range as these really impressed me. Next up, water. As you may have seen in my 16 Things for 2016 post, I wanted to increase my water intake as I felt that I really wasn't drinking enough. Water is super important when leading a much healthier lifestyle, so I was super happy to receive a bottle of the Nuva Ginger and Lemon Spring Water*. I love flavoured waters, my favourite being the Volvic Lemon and Lime water. But when I tried this one from Nuva, I was really impressed. It was such a lovely, not too overpowering ginger and lemon flavour, that I drank this first thing in the morning before breakfast, just to make my body feel refreshed and get it started for the day. Finally, another water related product here. I was kindly gifted a variety of Stur Water Enhancers* to try and test, and they have definitely helped me in my aim to drink more water and increase my daily intake. I was sent 2 Real Brewed Tea with Lemon, 1 Real Brewed tea with Peach and the Boldly Blackcurrant and Apple Flavour, all of which are super tasty, but my favourite has got to be the Real Brewed Tea with Lemon, its such a refreshing drink for the early mornings and I've been having a pint of water each day before breakfast, with a little squeeze of it, just to add some flavour. My first impressions of Stur, I would highly recommend them to anyone who finds plain water boring to drink, as these are a great little additive that can help add some fruit flavour and help you to increase your water intake. They also come in such handy travel sized containers that they are easy to take on the go an add to some water wherever you go! What new foods and drinks have you been trying this month? Would you consider purchasing any that I have included in today's post? For today's post, I've teamed up with Aqua Pura, who kindly sent me a whole load of natural mineral water* and some great tips to share with my readers, as well as what I have personally been doing to help me and you feel good and get that extra mood boost to lead a happy and healthy lifestyle. Aqua Pura has provided a list of the following top ten ways to feel your best, how many have you tried or think you could incorporate into your daily lifestyle? 1. Begin by finding a brave friend to start this next chapter with you - having some friendly support (and a bit of healthy competition) should help! 2. Water, water and more water - An amazing 70% of the body is made up of water, and you need to drink around 6-8 glasses to stay hydrated! 3. Move it, move it! - Take the stairs, walk to work or even go to a few classes at your local gym. Find new ways to incorporate exercise into your daily routine. 4. Self motivate! - Don't go for a complete lifestyle overhaul on day one - set yourself achievable goals that you can aim for and conquer, changing your routine one step at a time. 5. Eat a good breakfast every day - Try to get up ten minutes earlier so you have time to enjoy a healthy breakfast before dashing out the door. 6. Snack wisely- If you're feeling a little peckish between mealtimes, grab some unsalted mixed nuts, chopped raw vegetables or dried fruit, and wash it all down with a glass of - you guessed it- water! 7. Enjoy your surrounding - Get to know your local area or reacquaint yourself with nature by going for regular walks. 8. Try something new - As well as cutting out some of your bad habits, introduce some new and exciting recipes and hobbies, and see what works best for you and your lifestyle. 9. Moderation is key - Don't be so strict on yourself that you ban everything you enjoy, but be sure to stay healthy as much as possible so that you deserve the occasional treat. With all these tips in mind. I wanted to share some of the ways I have chosen to feel good and improve my lifestyle. Firstly, I have been drinking a lot more water recently and find that this has given me so many health benefits, it's amazing. My skin looks clearer, more radiant and less dull, plus my hair feels and looks shinier and healthier, as well as having less split ends. Also, I have been walking to the train station instead of taking the bus, this really allows you to get some fresh air and clear your mind, as is a great way to incorporate some exercise into your daily routine, without it being too tiring and vigorous. I've also been improving my diet and incorporating healthier alternatives, making exciting breakfasts daily, trying new foods and recipes and better snacks that are much better and nutritious for my body. What tips and tricks do you swear by to help you feel good? "Twinings pineapple and grapefruit infused green tea is a tropical inspired blend of sweet juicy pineapple and tangy grapefruit with the delicate tones of green tea. A fusion of flavours to invigorate and refresh." When it comes to hot drinks, I am a huge lover of tea. Normal breakfast tea, fruit teas, peppermint teas and especially green teas. Green teas are just so good for your body, loaded with antioxidants and nutrients, its a great drink to help cleanse the body and improve your health, with regards to weight management, metabolism, skincare and general bodily functions. Whilst browsing my local supermarket at all the flavours of green tea they had to offer, this specific one from Twinings stood out to me the most. Pineapple and Grapefruit. It sounded so sweet and tropic and exotic and fruity, I knew I just had to give it a try, and I was certainly not disappointed! I'm slightly addicted! Twinings Pineapple and Grapefruit green tea is a perfect drink to start your mornings with, its just so refreshing and gives you that kick-start you need to the beginning of your day. Just don't leave it to brew for too long, as that is when it starts to get bitter and you don't get to taste all the sweetness from the fruits. I find this flavour of green tea so refreshing and tasty, that I certainly want to try some more of the fruit flavoured green teas that Twinings have to offer! Next on my purchase list is the mango and lychee green tea and the pomegranate green tea. They both sound delicious! Have you tried Twinings green tea before? What are your favourite flavours? Early mornings are never my kinda thing. Multiple alarm snoozes later and I always find myself rushing around to get ready for the day, and always forgetting to have any kind of breakfast. Cereals and toast with butter/jam/peanut butter always get a little boring, so I wanted to find something that I could eat on the go and something that was still good for you. So on a recent food shop, I browsed the aisles looking for some inspiration among the cereal bars and snack sections, and came across something I liked the look of. Belvita appeared to have various varieties of there breakfast biscuits, so naturally as a chocolate lover, I was drawn to the Cocoa Choc Chip biscuits, and they have definitely not disappointed! Packed with 5 wholegrains and 4 hour slow release carbohydrates, these breakfast biscuits are great for those in a rush, but still want something quick, easy and nutritious whilst on the go. I would highly recommend these to anyone looking to try something new for breakfast or even as a mid morning snack, as these are absolutely delicious! However, if choc chip isn't your thing, these biscuits come in a number of different varieties, including crunchy oats, forest fruits, fruit&fibre, honey&nut and milk&cereal. So there is definitely a flavour out there for everyone! I know next time I'm at my local supermarket, I will 100% be picking up some more of these as they are the perfect snack to start the day with! 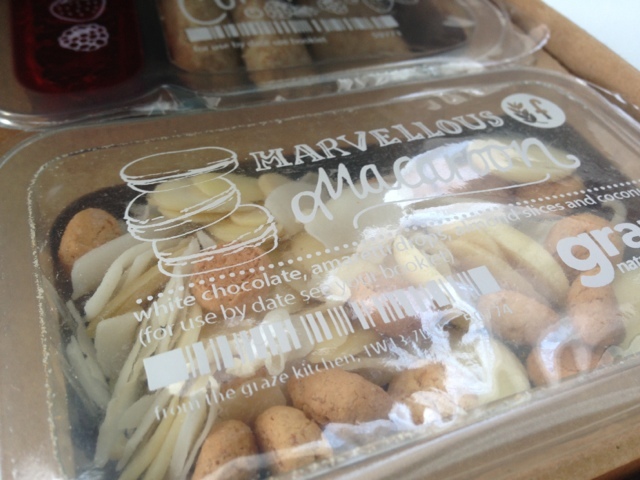 Have you tried these Belvita biscuits before? What are your go-to breakfast ideas for on the go? Today's Fitness February post is just a short little guide to my top 10 essentials that I think are needed for any fitness workout or exercise. For me, a good, durable and comfortable pair of trainers is a definite must have for anyone who is looking to get into exercise and beginning any fitness workouts. Investing in quality footwear can help you to prevent injuries, mainly foot and ankle damage, and make your workout a more pleasant, enjoyable and comfortable experience. As a women, having a comfortable, supportive and well fitting sports bra is a must for any physical activity as continuous movements can result in soreness, pain and sagging of the breasts. In general, your sports bra should feel slightly tighter than your regular bra, however, you should still be able to breathe deeply and comfortably. You want something that is going to be comfortable, practical and suitable for your desired exercise or workout. You don't want something that is too tight and restrictive, as this can stop you from performing well, as well as making you feel uncomfortable and isolated. Tracksuit bottoms are my preference! They are super comfortable and warm, and perfect for day to day wear and perfect for any weather type. A yoga mat can probably be the most beneficial for those doing floor exercises or stretching. a mat provides padding and support. For many people, pressing their bodies onto the bare ground or floor can be painful and sore, especially on the palms, knees, elbows, and vertebrae of the back. A water bottle is another must have item. Whilst exercising, you are constantly losing water from your body, through breathing and sweating, so it's important that you keep hydrated and keep up your fluid intake. Whilst working out, you don't want clothing that feels tight and uncomfortable - this just makes you feel slightly insecure and makes you lack confidence, especially if you are wanting to lose some weight. Choosing loose fitting tops is perfect for exercise, they aren't too tight, breathable and for me, I think they are perfect attire for a workout. 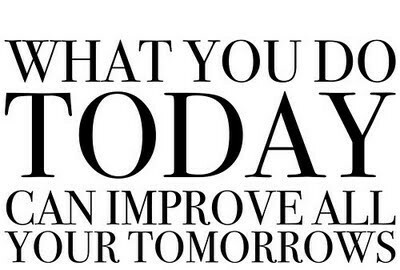 Creating a workout schedule or routine is a great way to begin getting fit and healthy. By sticking to your schedule, this gives you something to stick to, be committed to and doesn't allow you to "cheat". Even if you choose to go running once a week, exercise at home everyday or go to the gym twice a week, sticking to this will boost your confidence and give you that encouragement you need to stick to your routine. Having an upbeat, motivational music playlist helps to your keep focused and keep your mind on your exercise. Music can also help you to enjoy exercise a lot more and also make it fun! Keeping a fitness diary/log is a great way to record your progress and see how far you've come! Its a great way to record your weight loss, your exercise routine or even how far your running/swimming/cycling each week! You'll be able to see how you're improving and progressing, to get to the place you want to be at the end! A must have essential! Whilst exercising, the last thing you want is your hair flying in your face, getting in the way, getting sweaty and just annoying. Hairbands and clips are just needed to keep your hair back and out of your face. What are your fitness essentials? Do you use any of these? Will you take any of these on board and included them in your workouts? So, welcome to Part 2 of how to "Get Fit and Healthy At Home"! You're all probably thinking what on earth I am going to be talking about, but in today's post, I am going to be sharing 5 simple tips, that you can incorporate into your everyday life, that can get you on your journey to leading a healthier and fitter lifestyle! I am no way an expert in this field, but what I have learnt in the past, is what I shall be sharing with you! 1. Walk, Jog, Run, Cycle (if you have a bike), Its Free! A great way to keep fit and healthy, is to do exercises such as walking, jogging, running and cycling, which can all cost nothing and can be done any time and anywhere. This is perfect for those who don't have time to use the gym, have a small living area or have lots of commitments, which means they just don't simply have the time. Even taking the stairs instead of the lift/escalator, getting off the bus a stop early or walking to the shops etc, can all add up to your daily exercise and help you to become that little bit fitter and healthier. I'm sure we all know how stressful and time consuming weekly shop can be sometimes, but writing a list and making a plan is an easy way to make this chore more enjoyable. Planning a weekly menu can help reduce food waste in your home, as well as keep you on a diet plan/healthy eating schedule, as well as helping you to avoid distractions and purchasing anything that you don't actually need. You may even save yourself a little bit of money by planning your shop! If you aren't feeling motivated or inspired by doing the same workouts each time or using the gym all the day, taking time to browse through Youtube videos or fitness blogs can help you gain some new ideas and new inspiration of things to add into your everyday life. I recently posted about using Youtube as a workout inspiration guide, and shared some exercise videos that can be done in the comfort of your own home. There are many different ways to boost your metabolism, which helps to burn calories and help with weight loss. Eating more protein is the simplest way of increasing your metabolic rate. Food such as eggs are a great source of protein and beneficial saturated fats, as well as salmon which is highly enriched with Omega 3. Another idea is to replace your snacks with small handfuls of nuts, which makes your digestive system work harder throughout the day and therefore use more calories. By spicing our food, with spices such as chilli, ginger and tumeric, these are great metabolism boosters, that aid to burning calories and aids weight loss. Also, eating little-and-often is a beneficial in the role of helping to maintain a healthy weight and keeping hunger/snacking at bay. Working out at home doesn't have to cost a fortune, and neither does your equipment. If you're on a tight budget, don't have time to hit the gym or just find exercising hard to fit into your schedule, using home furniture/interiors/objects can help you with your workouts. You could use tins and cans as weights, use your stairs as a step up, use chairs or tables for exercising, as well as spacious floor space. So there we have it, this is second part of my "Get Fit and Healthy At Home" series. Hopefully you have learnt something new or have taken some advice on board, in which you can incorporate into your everyday life! If you missed part one, you can view that post here. How do you get fit and healthy at home? What tips and tricks do you have? Is there any of these tips you would like to start including in your day to day life? So, welcome to Part 1 of how to "Get Fit and Healthy At Home"! One of the most important, influential and easiest ways to have good health is through having a healthy, balanced diet. Eating well and drinking plenty of water also prevents any future disease/illness and helps to remove any toxins/waste from the body, as well as maintaining a healthy body weight. Making sure you have a balanced diet allows you to get all the nutrients your body needs to functions, and there are 5 main groups that you should focus on; Carbohydrates, Vitamins and Minerals, Fats, Fibre and Proteins. These are all essential for providing energy, growth, repair, bodily functions and keeping your cholesterol levels controlled. I spoke a little about this in a previous post, so I wont go heavily into detail here, but sticking to a routine/schedule is a great way to start a fitness/health plan, that you can follow and modify as you progress. By sticking to your schedule, this gives you something to stick to, be committed to and doesn't allow you to "cheat". Distractions - this is what would stop us from achieving our goals, reaching our targets and following our schedules. Technology can be one of the biggest distractions, whether its your mobile phone, your laptop, your favourite TV show etc. These make us lose our concentration and will make us feel less motivated to workout, as something else you would prefer to do/watch is there. Even your friends and family can be a distraction to you, if the pop over your house without you know, invite you out for a meal/night out etc, this can put you off your routine and stop your progress. Its always important to stay focused, stay motivated, stay determined and forget those distractions! If the gym is a no-go place for you, whether it be dues to lack of confidence or just lack of funds, working out at home can be free and easy - as long as you have the environment for it. Having a large, spacious room, gives you a lot of room to workout in, where you have the space to do various exercises and activities. I think its definitely important to make exercise and healthy eating fun, we don't all want to feel stressed and depressed, and just generally lazy and lethargic! Exercise can be fun right? Maybe get a group of your friends round and do a workout aerobic or dance DVD, go running with your partner or go over the park with your family for a game of football or whatever sport you like to play, just make sure its something you like and you know you will enjoy! Having a healthy diet doesn't always have to be unappealing or boring, in fact it can be delicious and tasty! Now having a healthy diet doesn't mean you just have to eat vegetables and fruit everyday, you can make near enough any of your favourite meals, but with healthier ingredients, that taste amazing are are better for you! So there we have it, this is part 1 of my "Get Fit and Healthy At Home" series, where the second part to this will be posted shortly! Hopefully you have learnt something new or have taken some advice on board, in which you can incorporate into your everyday life! Getting motivated is the best way to start/continue with your fitness/diet routine or just leading a better lifestyle, but finding that motivation can definitely be hard sometimes, especially if you don't have the support, knowledge or guidance that you really need. In today's post, I'm going to be sharing with you my top 5 tips to getting motivated, and tips that I have started using myself, in order to get fit and healthy! As I said, I'm definitely no expert, but I'm hoping what I do, with motivate, inspire and help you with where you want to be/what you want to do! We all know that exercising on your own, or improving you diet can be very hard if you don't have the support and help from others around you, but starting your fitness/diet journey with someone else can make it 10 times easier for you! Having someone you know, who are close with and feel comfortable around, is a great way to feel motivated and encouraged. It's also a way to build a closer friendship/relationship, to get to know someone better, or even just to have some fun and let your hair down, whilst getting sit and healthy! 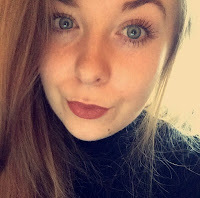 There may be those times where you feel like you just cant do something or you're struggling with something, but having that someone there with you can give you that extra boost and guidance you need, as well as that moral support, that can spur you on to achieve your goals and aspirations! Setting yourself goals, and by goals I mean realistic and achievable ones, whether you want to loose 5lbs in 5 weeks, or 1 stone in 2 months, dropping 1 or 2 dress sizes or even entering a running event, just make sure they are realistic and reasonable! Setting goals helps you to keep focused, motivated and determined to get to that place you want to be, whether you choose a few weeks, few months or even a year. Setting goals and keeping a fitness diary, can also be a way or treating and rewarding yourself. By reaching your goals by certain dates/months, you can treat yourself to something as a way to feel proud and pleased of how far you've come and what you have achieved! This might sound like a bit of an obvious one, but ACTUALLY buying your workout clothing and accessories gets you motivated to start using it and begin your fitness/diet routine. There are so many different clothing items out there, whether you want proper fitness gear or even a plain top/vest and trackies/leggings, there's always something for very body shape and budget, you just pick what you feel comfortable and confident in! I feel that these are the very basics that you need to begin getting in shape and leading a healthier and fitter lifestyle. You can pick most of these up anywhere, in your local high street, supermarkets or even online. If you're on a tighter budget, there are still places for you, check out the sales in your local shops and online! You'll be sure to find something you'll love! I think that creating one of these is a great idea, you can build up your schedule slowly, making sure you're not doing too much to exhaust yourself, just make sure you are flexible and realistic, and when you feel the time is right, you can slowly and steadily, build up your routine gradually. To get motivated, feeling inspired and being determined plays a huge role in this. There are many ways to do this, and here's just a few. - Having photographs of yourself, or areas of your body that you aren't happy with dotted around in your exercise area, is a great way for you to feel motivated and determined to improve this. - If you're looking to lose weight, buying something you love in a small dress size, will give you that boost and determination, to be able to fit into it and look great! - This is probably a controversial one, but having images of celebs/role models that you think have a great body or just look great, will help you get inspiration! - Printing out motivational quotes and putting them around your house, will help give you that encouragement you need to continue and stick to your routines! So hopefully, If you're someone who is lacking that little bit of motivation, have no idea where to start or need some more help, this post has helped you that little bit! Getting that motivation you need to be successful and achieving your goals can be hard at first, but once you're there, you can do anything! How do you get motivated? Do you include any of these tips? What other tips do you have? 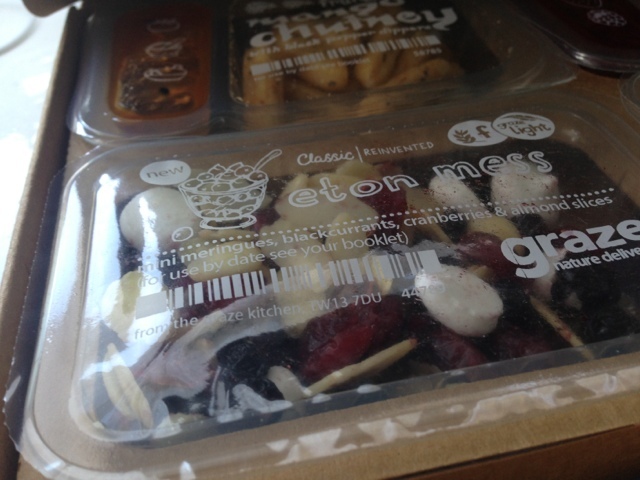 I'd heard about Graze boxes a while ago but didn't feel I really had any need for one. So I took advantage of an offer online, when I received a leaflet about graze with a recent order from New Look for a free box and signed up. When you sign up to this, you have the choice of going through all the snacks they offer, and choosing which ones you would like to try and ones that you never want to be sent. Even after your first box, you can cancel your account with no problems, if you didn't enjoy it, but hey its free food after all! They are normally priced at £3.89 a box, which may be slightly pricey for the size, but what you get is very healthy and tasty! 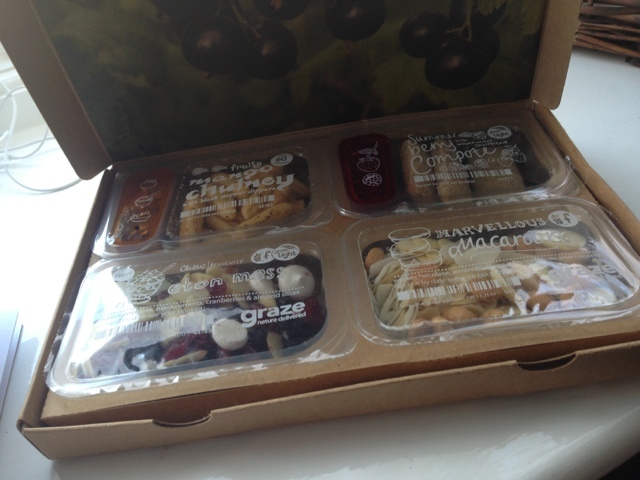 I received my first graze box in the post a few days ago - how very exciting! and was rather eager to see what goodies I had been sent, as you don't get to choose. However, they create your box with the items you have either clicked try, like, love or send soon, which I think is a great way of getting a nice selection. They also send you an email, when your box is being dispatched and also this gives you a sneak peak at whats in your box. Two little booklets welcoming you to Graze telling you about your box - calorie content, use by dates etc, which is a great little touch, especially for those concerned about there weight and what they eat. Also I liked the fact that under the packages of food you got a little napkin, which can come in handy, its the little touches really make this a great scheme. Overall, what I received in my free box, I really did like. 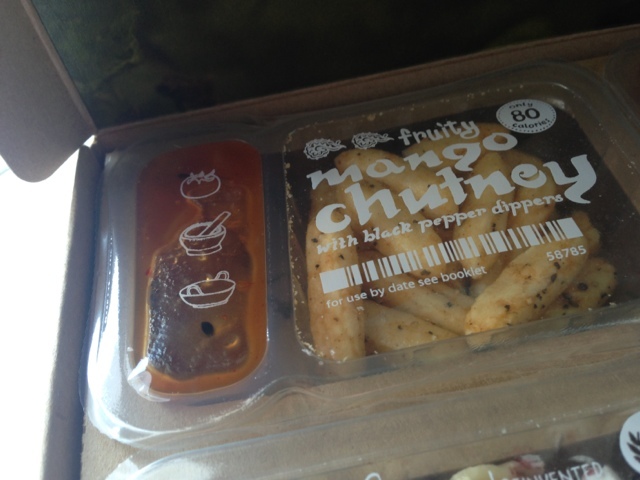 It was bursting with lovely smells and flavours, and were very tasty snacks! I would recommend everyone to at least grab a free box and try it for yourself, even if you don't like it, you gave it a go and its free! 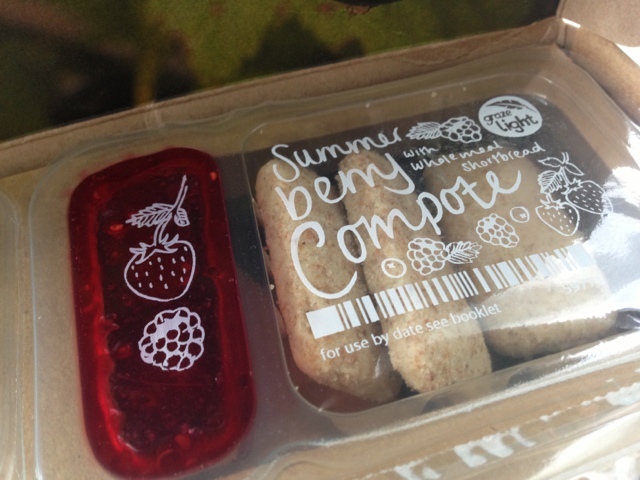 My favourite from this box was definitely the Summer Compote with Wholemeal Shortbread! Have you tried graze before? What's been you favourite snack? Would you be interested in a free box? Is this something you would try just once?